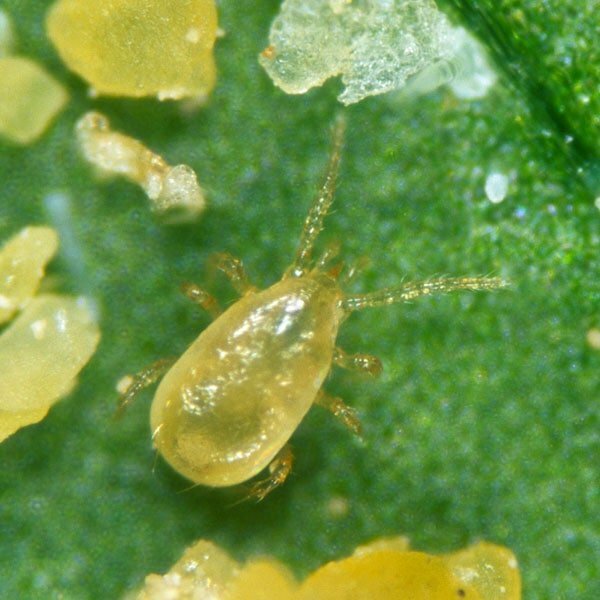 This small predatory mite moves quickly to capture its prey which is the egg and larval stages of various thrips species. Thrips are tiny pests capable of doing sizeable damage to plants. The thrips predator (Amblyseius cucumeris) moves quickly to attack eggs, larvae and small adult thrips. 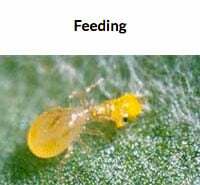 Female thrips predators, while consuming two to three thrips a day, also lay two to three eggs a day, multiplying the beneficial insect’s population as it feeds. 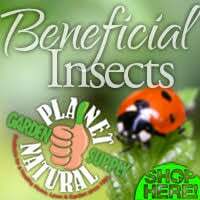 Shop our large selection of biological controls, including thrips predators, at Planet Natural. One bottle — 50,000 predatory mites — treats up to 2,000 square feet and costs $84.95 with UPS Express shipping included! 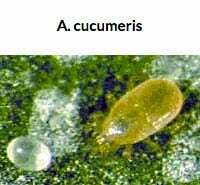 A. cucumeris, like thrips themselves, are small (1/16 inch or less). These tan colored predatory mites are hard to spot. 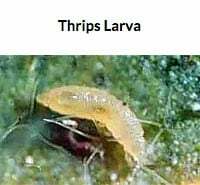 They are best introduced ahead of infestations or when thrips are first noticed, allowing the predator time to establish an effective population before their prey has a chance to gain footing. Once thrips populations are eliminated, this effective biological control will stay established in gardens and greenhouse, feeding on pollen and spider mites. The delicate predator eggs are deposited on fine hairs found on the underside of the leaves. Tiny nymphs hatch within two to three days and begin feeding on pollen, pest eggs and the smallest thrips. Their entire life cycle is no more than three to four weeks. Adults are a pinkish beige, tear-drop shaped with short front legs. They’re often found resting in hiding places including leaf-stem junctures along leaf veins and in flower heads. Spread the material evenly over leaves and throughout crops. When introduced on rockwool, place in small heaps (2.5 ml/ plant) to encourage reproduction. 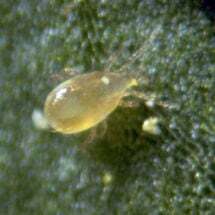 Note: These predatory mites are fond of high humidity and do particularly well in greenhouses. Keep the relative humidity above 75% and the temperature above 68°F for some hours of the day.